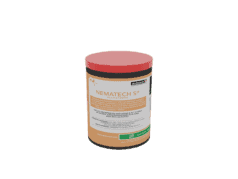 NEMATECH S ® SP is a biological insecticide containing infective juveniles of Steinernema feltiae (isolate DDT – D2) in an inert carrier for the control of Thrips and Sciarid flies in both field or greenhouse set up. Third stage larvae (Juvenile 3); 0.6 – 08 mm in size. For control of Thrips in field and greenhouse crops, NEMATECH S ® SP may be applied as a foliar spray (in closed greenhouse) or as a soil drench. For the control of the larval Sciarid flies (Diptera: Sciaridae) on mushrooms, NEMATECH S ® SP may be applied to the site at which control is required, by any standard method used in pesticide application. This include; incorporating into compost forming the mushroom bed, incorporating into the casing layer of the mushroom bed, spraying onto compost contained in or the casing layer of, the mushroom bed or applying NEMATECH S ® SP to the mushroom bed as a spray drench or with irrigation water during cultivation. Mix the required amount of the water soluble product with water (15 – 20°C) and stir well to form a uniform suspension. Apply to the garden or compost mix using a watering can and onto larger areas using drip irrigation or standard high volume spray equipment at a minimum water rate of 1000 litres per Ha. Use a maximum pressure of 5 bars and spray nozzles of at least 0.5 mm. All filters must be removed to avoid blockage. Applications should be done early morning or late evening for maximum target reach, ensure continuous mixing during application. Irrigate immediately after application in case of soil drench. Use the entire package content. Apply 2.0-2.5 billion Juveniles of Steinernema feltiae per hectare (200,000-250,000 juveniles per square metre). Depending on the pest pressure NEMATECH S ® SP can be applied between 2-3 times every 5 –14 days apart. When the pest pressure is high apply 3 times 1 week apart. When the pressure is low apply once every 4 weeks. Depending on the pest pressure NEMATECH S ® SP can be applied between 2-3 times every 5 –14 days apart. When the pest pressure is high apply 3 times 1 week apart. When the pressure is low apply once every 2 weeks. NEMATECH S ® SP is packed in a 1.2 litre container with 250 million infective juveniles in an inert carrier. Store and transport at 8-12°C, do not freeze. Maximum storage time in original unopened container is 3 months from date of manufacture. Although NEMATECH S ® SP is compatible with most fungicides and insecticides tank mixing is not recommended. Simultaneous use of Nematicide must be avoided.